Performing in the magnificent 16th century synagogue of Ancona, Italy. 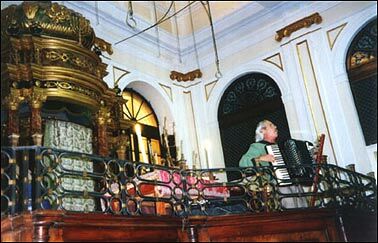 Scattered among the world’s cultures for 2000 years, the Jewish People developed as many musical milieus as the lands they inhabited, yet clung tenaciously to their ancient, unique traditions, based in Biblical texts and the yearly festival cycle. As a result, ‘Jewish Music’ can be regarded as the original ‘World Music’, exemplifying innumerable instrumental and vocal styles. These reflect the historical heritage of the diaspora, and the adaptive cultural strategies which enabled Jews to survive while living within alien societies. In his concert presentation, Willy Schwarz takes the audience on a musical world tour, offering glimpses into the heart of Jewish life as experienced in many lands and in many different ages. Singing in 9 different languages, playing 12 exotic musical instruments, Willy is an unparalleled tour guide, leading listeners from Morocco to China, from the Ukraine to the Lower East Side, from Ethiopia to Bosnia with wit, experience and deep feeling. Many of these musical idioms have all but disappeared, making Jewish Music Around the World equally fascinating for both Jewish and non-Jewish audiences. Willy Schwarz has presented this program for synagogues, churches, festivals, universities, clubs and concert series throughout the USA and Canada, as well as across Europe. For inquiries, click here.